(CNN) -- Robin van Persie has put an end to speculation about his Arsenal future by signing a new long-term deal with the Premier League side. Van Persie topped the Arsenal scoring charts last season with 20 goals. The Dutch international striker was Arsenal's leading scorer last season with 20 goals from 44 appearances and had been linked with a move to arch-rivals Manchester United. But the Gunners announced Wednesday that a new contract had been agreed although the terms were not disclosed. Van Persie, who joined Arsenal from Feyenoord in 2004, said he was delighted to sign on the dotted line. "I have been at the club for five years now and there really is a great feeling here at Arsenal," he told the club's official Web site www.arsenal.com. "We have a top-class manager, a squad full of superb young players, a world-class stadium and brilliant supporters. In a hint he might end his career at Arsenal, the 25-year-old added: "My heart is with Arsenal and I just can't picture myself in a different shirt." Manager Arsene Wenger is delighted to have secured van Persie's signature. 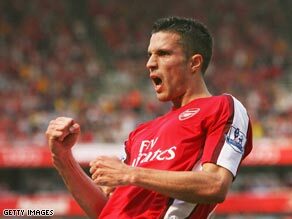 "It is fantastic news that Robin van Persie has committed his long term future to Arsenal. We are all delighted," he said. The Frenchman has moved during the summer break to tie up the long-germ futures of promising youngsters Jack Wilshere, Aaron Ramsey and Kieran Gibbs, but is aware he needs to keep his experienced players such as van Persie and Cesc Fabregas. "Robin has the potential to become a true Arsenal great," he added. Arsenal are reported to be in the chase for Brazilian midfielder Felipe Melo, but reports in Italy claim he is close to agreeing a move to Serie A giants Juventus.